After preaching and leading worship for what felt like 4 of the more challenging weeks in my life, a youth from the church approached me after the service on Sunday. In his eyes I saw a the beginnings of a question and I mentally prepared myself to respond. I have attempted to be as clear as possible about the situation the UMC finds itself in, and I have tried to preach faithfully in the midst of it, but the look on the young man’s face left me worried that I had been anything but clear. I, constantly over thinking everything, made an assumption that he wanted to know more about the denomination’s stance on human sexuality, or where the UMC is heading, but what he really wanted was some advice as he prepares to journey to Philmont this summer with his Boy Scout Troop. When I was the same as as the young man I was fortunate enough to travel to the Boy Scout ranch in northern New Mexico for what was one of the most formative experiences in my life. So, recalling those ten days and 102 miles, I told him about cutting down on unnecessary clothing, spreading communal gear across the whole crew, and making sure that he has enough bottles for enough water. And ever since Sunday afternoon, I’ve been thinking about that last item a lot. And, to be honest, it has been a long time since I’ve given a lot of thought to the most basic and important element of our survival: water. I can remember hiking out at Philmont nearly 15 years ago and not having enough water on a particularly brutal day. We started rationing it among the group as much as we could but at some point we ran out and we began panicking. With every mile we passed another dry creek bed and our lips continued to crack. However, when we finally made it to the next campsite that afternoon, there were arrows pointing to a fresh spring that was producing water. It was hot and it was brackish, but it was the most delicious water I’ve ever tasted in my life! The psalmist writes, “O God, you are my God, I seek you, my soul thirsts for you; my flesh faints for you, as in a dry and weary land where there is no water.” The desire to know God and to feel God’s presence is likened to wandering around a dry land looking for water. And yet, how often do we long for God in that kind of way? Many of us make our way to church on Sunday mornings hoping for something, even yearning for something, but would we describe it like the thirst while looking for a spring in the midst of a drought? Or perhaps the metaphor works differently. Maybe it’s not so much about our desire to be filled like a flowing stream, but the refined rarity of actually finding it. Today, many of us take for granted what has been made available to us in the person of Jesus Christ. We go about our Christian lives without having to think much about what we are doing. We enter church and see the cross but it doesn’t stand out to us in the stark way that it should. And yet, like water, without the cross and without Jesus we are nothing. For Zion’s sake I will not keep silent, and for Jerusalem’s sake I will not rest, until her vindication shines out like the dawn, and her salvation like a burning torch. The nations shall see your vindication, and all the kings your glory; and you shall be called by a new name, that the mouth of the Lord will give. You shall be a crown of beauty in the hand of the Lord, and a royal diadem in the hand of your God. You shall not more be termed Forsaken, and your land shall no more be termed Desolate; but you shall be called My Delight Is In Her, and your land Married; for the Lord delights in you, and your land shall be married. For as a young man marries a young woman, so shall your builder marry you, and as the bridegroom rejoices over the bride, so shall your God rejoice over you. I saw him walk by the window before I heard the knock on the door. We get a lot of foot traffic by the main office, and every once in a while someone will stop by the entrance to talk with the preacher. A few have asked for directions. Others have wanted information about the church. Most need some financial assistance. I stood in the doorway and extended my hand and offered for the guy to come in, take a seat, and enjoy the warmth of our building on a particularly cold day. He told me about his life, the ups the downs, the children and the wives, the bottles and the sobriety. He’s currently employed by the federal government but, like many, he’s not getting paid right now. On Thursday three white Chicago police officers were acquitted on charges that they had conspired and lied to protect a white police office who fired 16 deadly bullets into a black teenager named Laquan McDonald. The officers claimed that the young man had swung a knife at them repeatedly, and even though there was no evidence of the fact on the videos presented to the court, the police officers were released with no penalties. I was getting my oil changed this week when a woman in the waiting room leaned over and asked what I did for a living. And I told her the truth. She asked if I was being serious. She told me about how she grew up in the church, how the people in that church were salt of the earth, how they made her into who she is. I asked where she went to church now. She said she doesn’t. And, she remarked matter-of-factly, that church she grew up in closed a few years ago. All of us, in some way or another, are looking for answers. The people Israel were utterly devastated by Babylon – they were conquered, humiliated, and carted away as strangers to be planted in a strange land. An entire generation would pass before they could return to the land God had promised them. Most of them only knew about it from the fairly tales their parents would tell them. These kind of questions appear again and again in the Old Testament – frankly they are the kind of questions that just about everyone in this room have asked at one point or another, and if not yet, we will one day. For the sake of God’s people I will not remain silent! God has given me something to say! We confront a particular issue and we wrestle with a particular response. Sermons or programs end with a “lettuce” moment. Let us now go into the community to fix all the wrongs we encounter, let us challenge the powers that be, let us make the world a better place. And yet Isaiah doesn’t tell God’s people what to do. Isaiah begins by demanding that God needs to do something about the situation, that God needs to make good on God’s promises! Part of the power of this book, the Bible, the Holy Scriptures, is the good news it has to offer toward people who desperately near to hear good news. But the other part of its power is found in its ability to name the realities that people are facing all the time. We’ve been talking about what’s right with the church this month, and I can think of no better way to put it than this: the church tells the truth; the truth about us, about the world, and about God. Nothing in this collection of words makes any sense unless we are people of faith who believe that it’s true. However, there is a tension, the same kind of tension we wrestled with in Advent between the already and not yet. Isaiah announces and reminds God’s people about God’s promises. God has not, and God will not, abandon God’s people. But that strikes an uncomfortable chord when we consider how messed up this world is. What good is the promise of God in the middle of our pain? I get asked many questions. There’s something about this office that carries with it the implication that I get to see behind the curtain and have the answers to the questions that confound us. But, to be abundantly clear – there is no good answer to the question of suffering in the world. There is no good explanation for why horrible things happen, at least from the perspective of God. For instance: if I have to hear another pastor preach over the funeral for a young person’s untimely death with the words, “God just wanted another little angel in heaven.” I will throw my bible across the sanctuary and tries as hard as I can to hit the preacher right in the face. There are of course “bad things” that we experience and can point to the powers and principalities and personalities in the world and throw are charges against them. Like yesterday, during a peaceful indigenous peoples’ march in DC, a group of young white men surrounded and belittled an elderly Native American man while he was chanting and playing a traditional drum. We can point to the powers and principalities that have rewarded that type of bullying and discriminatory behavior that resulted in the scene from yesterday. We can call to question the behaviors and practices and motives and ideologies that lead to something like that. But even still, there are indiscriminately horrible things that happen to people in this world that are beyond explanation. How, then, are we to respond? Should we sit around twiddling our fingers in our own exile? Should we sit back and wait while things fall apart all around us? Should we offer trite and cliches responses to suffering because we don’t know what else to say? Perhaps one of the greatest responses to this suffering world is what David Bentley Hart calls “rage against explanation.” We, as Christians, rage against the desire and the drive to explain everything as if God allowed something to happen or willed something to happen. It’s the people who try to fill in the void created by tragedies with explanations of God’s plan that make God into a vindictive monster instead of the one who knows the truth of our suffering. I can remember being in the hospital one night while I was working as the on-call chaplain at Duke. The beeper attached to my belt felt like a shackle that I dragged around the building; I fretted over every notice and whether or not I would be called into a room filled with people looking for any explanation. And so when the beeper went off, I made a mental note of the room number, and started trudging toward the other side of the facility. When I got right outside the room, the doctor pulled me aside and said that the patient had been asking to speak with a professional pastor (which of course I wasn’t), and when I asked for more details the doctor just shrugged his shoulders and went back to making his rounds. I walked into the room and the woman looked me up and down, and then rolled away from me toward the window. At that point of the night I had already been in too many rooms and sat with too many families, so I just sat down in the chair and stared out the window with her. God is God and we are not. God thoughts are not our thoughts nor are God’s ways our ways. But once we begin to grasp even the smallest bit of God’s greatness, and majesty, and other-ness, then the news of Isaiah’s proclamation is even more bewildering and awesome – God rejoices over us. There is no good explanation for why certain things happen. We can’t make sense of the senseless tragedies that happen all around us. But this is also not the end. The Israelites eventually returned to a broken and abandoned community after their years in exile – they never quite experienced the promise they had imagined. But then, the time came, with God’s definitive act in the world, the incarnation. Jesus of Nazareth, fully God and fully human, came from the far country of God’s divinity to dwell among us, and then the ultimate price was paid such that the promise would come to fruition – not just for an individual, or even a nation, but for the entirety of the cosmos. In scripture and in life, God does not speak to us of why things happen. Instead, God speaks about how things can be. God speaks to us not in explanations, but in promises! Promises that we can scarcely imagine or even fathom. What Isaiah announced to the people called Israel, God has revealed to us in the person of Jesus Christ. We who were once far off, removed by our own exile, have been brought near by the blood of the lamb who was slain for the world. So we can rage all we want at the powers and principalities and personalities that are responsible for so much of the suffering in the world, but we can also rage against explanation as we walk hand in hand with those who are in the midst of darkness. Amen. Long ago God spoke to our ancestors in many and various ways by the prophets, but in these last days he has spoken to us by a Son, whom he appointed her of all things, through whom he also created the worlds. One of the things I loved most about the church I grew up in, is that I always felt like I could bring questions about faith to the pastors. They, like good clergy in the UMC, would come and go but no matter who stood in the pulpit on Sunday they offered a willingness to hear what was stirring within me, and they were always prepared to nudge me in the right direction. For me, a question would usually begin to percolate in the middle of a sermon. It would be a line, or a phrase, or even just one word that would stick out and from it I would journey into the unknown. Sadly, there were many times when that precise moment of question formation was when I tuned out the rest of the sermon and started searching in a pew bible for an answer. However, I would inevitably find myself more confused than when I started and I would patiently wait in line after church to drop my bombshell on the pastor. And it was on one such Sunday, long ago, while I was daydreaming about God that I got stuck on a particularly profound question: “Why don’t we hear God speaking to us like how God speaks to the people of the biblical narrative?” The text that morning must have been from a moment when God definitely spoke to a particular individual, and I wanted to know why I couldn’t hear God in the same way. And so I dug into the pew bible and went looking for an answer. But by the final hymn I was no wiser than when I started, so I asked the pastor on my way out. I only later learned that the pastor got the answer from the first chapter of Hebrews. That memory has stayed with me over the years because of how profound it actually was. Many of us expect to hear God audibly speak to us in the midst of our prayers like we’re talking to a friend on the phone, and then we immediately become disappointed when God appears to be silent. However, my pastor was right: God spoke God’s fullest word in Jesus because Jesus is, was, and forever will be the incarnate Word. God can and still does speak to us through a variety of means like a conversation with a friend, a particular verse from a hymn, or even in the rare decent sermon, but God will always speak into our world through the stories of Jesus in scripture. So, instead of reading the Bible like a collection of stories from the ancient past, can you imagine how life-giving it could be if we read it like Jesus was still speaking to us here and now? The beauty of the Bible takes on a whole new dimension when we stop limiting Jesus to the past, and start hearing him in the present. He called the crowd with his disciples, and said to them, “If any want to become my followers, let them deny themselves and take up their cross and follow me. For those who want to save their life will lose it, and those who lose their life for my sake, and for the sake of the gospel, will save it. For what will it profit them to gain the whole world and forfeit their life? Indeed, what can they give in return for their life? Stories are important. In life we use stories to teach children valuable lessons about what it means to be a person in the world. We are captivated by the narratives portrayed in both books and on the big screen. Stories can make us cry, they can make us laugh, they can take us out of ourselves, and they can teach us who we really are on the inside. And, for better or worse, we are the stories we tell. Your story, the one you two share, is a good one, and frankly one that I’ve found myself telling to other people recently. I mean, could it be any cuter to witness the marriage of a couple who met in the 2nd grade? Think about the Lifetime Movie Channel possibilities! Cameron and Victoria sitting across from one another at the table, helping one another with their reading or their spelling, only to now be standing across one another by the altar. A relationship born out of childhood birthday parties in which the possibility of marriage was not even a twinkle in either of your eyes. But then the story takes a turn, from the connection catalyzed in Featherstone Elementary School (just on the other side of the road from where we stand) to Victoria moving away. The story then fast forwards to years and years later, in adulthood, when Victoria moved back into the area for family reasons. And what does she do? She takes the initiative and reaches out to the friend from elementary school. Why? Has she had a crush all of these years and she finally wants to bring it to fruition? Have they been sending love letters back and forth over the decade plus? No. You were just friends, and friends spend time together. And so you did. You reconnected and started telling each other stories of the lives you had lived in the time in between. You learned each other’s narratives, you discovered common interests, and varied perspectives. And with more and more time passing, with more stories being told, you two spent enough time together than you started developing your own story. You went places together, you explored new adventures together, and you even went to parties together. Are we going to take the only logical steps in this budding relationship in which I am discovering the truth of myself in you? Are we going to become the people God has called us to be, by being together? Are we going to be in the relationship everyone already thinks we’re in? Stories are important, they are at the very heart of who we are and who we can be. But for as much as stories are important, questions are too. Cameron, please hear me when I say this, and please don’t let it go to your perfectly bearded head: Your question for Victoria is the same question placed before everyone who claims to follow Jesus. In that profoundly beautiful, and somewhat funny moment, you laid out all your cards for what would become this moment. And when Jesus asked his version of your question, it paved the way for what would become the cross and the empty tomb. I know that it might sound strange to be thinking about Jesus’ death and resurrection at a wedding. You might prefer to hear about love, or beauty, or even faith. And even though marriage might have all those things, marriage is really more about commitment, and courage, and even crucifixion. Victoria, I never learned exactly how you responded to Cameron’s question, whether it was an emphatic yes, of if you merely beamed. But regardless, your answer is what brought both of you here. Your answer led you to into a relationship that was forged in the fires of commitment and courage and a sacrifice all too similar to Jesus’ life, crucifixion, and resurrection. And your marriage will contain even more of it. Marriage, the covenant in which you two are about to enter, is nothing more than the confusing claim and question Jesus offered the crowd. If you want to gain new life in your partner, if you want to step into this new reality, you’re going to have to deny something within you – a desire, a dream, a daring possibility. Because in just a moment, your lives will no longer be your own. They will become inextricably tied around and with the person standing before you, and as we say, for better or worse. But the absolutely beautiful and breathtaking part of marriage is that those lives, those stories, never really belonged to you in the first place. Cameron, you have an incredibly dedicated work ethic and you give every little bit of yourself to everything you do, to a fault. No matter what, you tend to put other’s needs first whether it means sacrificing something you want to do, or showing up for someone who might not show up for you. And you’re really funny, or at least you think you’re really funny. But I, and Victoria, think that one of your greatest qualities is that you are remarkably even keeled even when it might feel like life is falling apart. Victoria, you care about other people including Cameron more than just about anyone else. You embody what we in the church call discipled selflessness. You are definitely the planner in the relationship bringing a healthy dose of organization and purpose to all that you do. And, you are extremely punctual, which is made all the more perfect and beautiful since Cameron lives in his own time vortex. You two are really similar in a lot of ways, and in particular with your commitment to other people. And yet, you are also very different. Frankly, I’m still trying to wrap my head around the fact that Cameron you are a hunter and the Victoria you are a crafter, and that you both have separate rooms at your house dedicated to these very different interests! I keep waiting to hear about the mash-up of these things like Victoria taking the time to knit a camouflage scarf or Cameron building a tree stand with popsicle sticks and a hot glue gun. When that inevitably strange compilation comes together, I want to see it! You two are the stories you tell, varied and weaving stories that come together right here, and right now. But those stories never really belonged to you in the first place. To take up the marriage language again, we are the story God tells, for better of worse. We are the characters in the great novel of salvation, in which every chapter is better than the last, one that goes on forever and ever. God, for some reason or another, wrote your lives in such a way that you would now prepare to enter into the new blank page of the greatest story ever told. And lest you two fall prey to the temptation to believe that this was all up to you, and will be all up to you, I want you to turn around for just a moment, and soak up this view. Far too many weddings are focused in this direction alone, and we miss the beauty behind us; the profound wonder of a community of people who made a covenant to hold you accountable to your covenant. Your stories do not belong to you, because they also belong to all of these people, from and whom through God is penning this one. When we met for pre-marital counseling, I asked you two to consider what marriage really is. Not according to the world, or your parents, or even a favorite movie – I wanted to hear what you think marriage is. And you said marriage is like having an extreme best friend, in which everything is out in the open. It is a strange and wonderful new beginning together. And then you said that that getting married here, at this church, made perfect sense because we’re right across the street from where it all began. And so may the author of salvation, God the Father, Son, and Holy Spirit – the beginning, middle, and end – bless you in your marriage so that you may continue to tell the story of you were, who you are, and who you will be. So, are we going to do this thing or what? Of all the questions I get asked, the one I hear the most is: “What’s heaven like?” I’ll be down in the preschool when one of the children will saunter over and randomly ask the question with their eyebrows askew. Or I’ll be sitting with a grieving family planning a funeral service when a new widow will ask the question as if she’s never really thought about it before. Or I’ll be working on a sermon in a coffee shop with my bible open on the table when a stranger will walk up to ask the question out of nowhere. If Hallmark, the Lifetime channel, and uncles who tell bad jokes have anything to say about it, then heaven is a mysterious place in the clouds with fat little cherubic babies floating around playing harps, golden arches keeping certain people out, and Saint Peter sitting with a ledger. If one of our preschool parents has something to say about it, then heaven (as she told her daughter) is a place filled to the brim with her favorite candy. But if scripture has anything to say about it, then heaven is like a never-ending worship service. Which, to some people, sadly, sounds more like hell than heaven. However, the bible is forever making connections between the worship of the Lord here and now, with the worship of the Lord in the New Kingdom. And not the announcements that always take to long to list at the beginning, and not the logistics of sitting down and then standing back up for hymns, but the beauty and wonder of encountering the beauty and wonder of the Lord. The psalmist says the one thing worth seeking after is to live in the presence of the Lord each and every single day, to behold the beauty of the Lord, and to wonder and inquire in the house of God. In weekly worship, when we experience God’s faithful presence through a choice phrase in a prayer, or a melodic move in a hymn, or even a powerful sermon, we are catching a glimpse of heaven on earth. For when we gather in the house of the Lord, when we are confronted with God’s majesty, what could be better? When I go on mission trips, I love asking youth a familiar set of questions. For instance: After a few days of cold-cut sandwiches for lunch at our work sites, I always ask them to share what would be their ideal meal. In a matter on minutes, strangers become best friends over their intense bonds with the likes of Gummi Bears, Big Macs, Snickers Ice Cream Bars, etc. Occasionally I will ask them to share their favorite movie or book, and I always wind up asking about their favorite story from the bible. The questions are a mechanism by which conversations will begin to flow, but it also helps to create friendships over shared interests with people that never imagined they could be friends. A few weeks ago while I was serving with a mission team in McDowell County, WV I asked the group one of my go-to questions: “If a Genie offered to grant you one wish, what would you wish for?” Some of the answers were hysterical: “I would ask for a swimming pool full of chocolate syrup” “Definitely a basketball court as my bedroom” and “french fries; lots and lots of french fries.” The question got the conversation flowing and we all began to debate the merits of our particular wishes compared with the wishes of our peers. Later on that afternoon, while we were cleaning up our tools before heading back to our main site, one of the younger boys from my crew approached me with a strange look on his face. He stood next to me for what felt like a long time before he finally spoke. “I’ve been thinking about your question, you know the one about the Genie, and I finally got my answer: I would wish to be more patient.” In all the quick responses to the initial Genie question, I neglected to ask this young man what he would wish for, and when he finally shared his answer, it hit me deep in my soul. After his father David died, Solomon was approached by the Lord and was offered anything he wanted. Solomon, though given the opportunity to request anything in the world, asked for wisdom. That young boy on the mission trip, rather than being led by selfish desires for wealth and power, told me that what he really wanted was patience. When we go to God in prayer, what do we ask for? 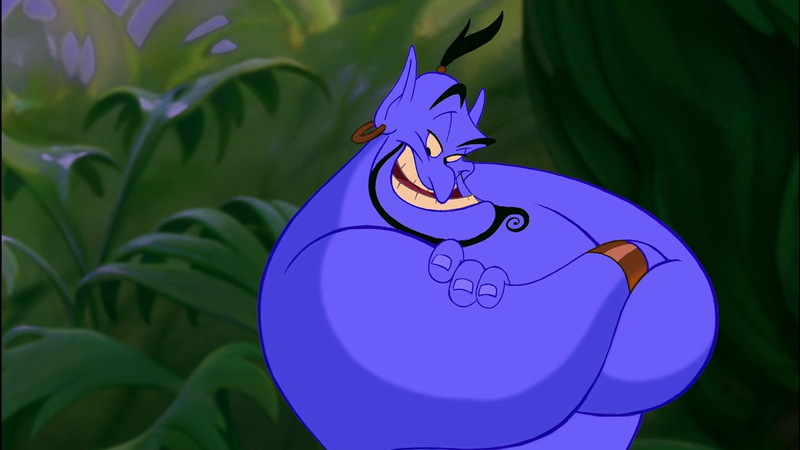 Are we treating God like a Genie who will give us our greatest wishes? Or are we seeking the Lord’s power to help shape us into the disciples God knows we can be?